More so than ever before, customers are relying on online reviews on sites like Yelp and TripAdvisor to decide what to buy, where to eat, and what service providers to hire. 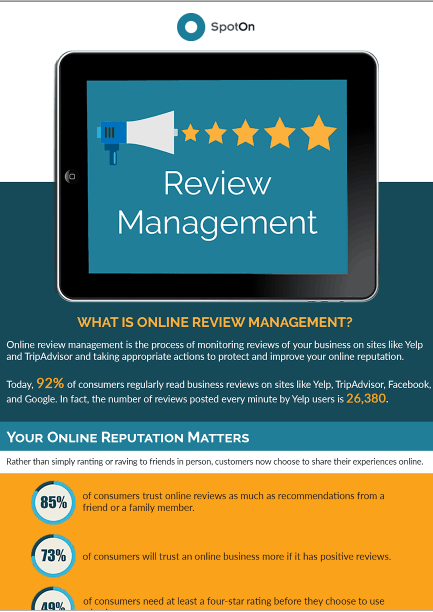 As a business owner, the difference between your revenue rising or falling can hinge upon how well you manage your online reviews. Ignore reviews and as few as one to three negative reviews can scare away 67% of your customers! On the flip side, a recent study showed that even a modest increase in your review scores can lead to an increase in revenue between five and nine percent. Clearly, there’s plenty of reasons to take online reviews seriously. To do so successfully, start by staying away from the most common pitfalls: do not pay for reviews, do not post fake reviews, and do not write angry responses to negative reviews. Instead, start by making sure you’re creating a positive, unique customer experience with your business. Next, make sure you claim your business pages on the most popular review sites, including Yelp, Facebook, Google, and TripAdvisor. Once you’ve done that, you can thank customers for leaving positive reviews, and follow the best practices for responding to negative reviews. If you find that all this is demanding a lot of time and resources, then you know it’s time to use a software solution to make review management easy. This infographic by SpotOn explains more about the dos and don’ts of review management.